Sir Henry Bessemer (19 January 1813 – 15 March 1898) was an English inventor, whose steel-making process would become the most important technique for making steel in the nineteenth century for almost one hundred years from 1856 to 1950. He also played a significant role in establishing the town of Sheffield as a major industrial centre. Bessemer had been trying to reduce the cost of steel-making for military ordnance, and developed his system for blowing air through molten pig iron to remove the impurities. This made steel easier, quicker and cheaper to manufacture, and revolutionized structural engineering. One of the most significant innovators of the Second Industrial Revolution, Bessemer also made over 100 other inventions in the fields of iron, steel and glass. Unlike most inventors, he managed to bring his own projects to fruition and profited financially from their success. Bessemer's father, Anthony, was born in London into a Huguenot family, but moved to Paris when he was 21 years old. He was an inventor who, while engaged by the Paris Mint, made a machine for making medallions that could produce steel dies from a larger model. He became a member of the French Academy of Science, for his improvements to the optical microscope when he was 26. He was forced to leave Paris by the French Revolution, and returned to Britain. There he invented a process for making gold chains, which was successful, and enabled him to buy a small estate in the village of Charlton, near Hitchin in Hertfordshire, where Henry was born. According to Bessemer he was given his name by his godfather Henry Caslon, who employed his father as a punchcutter. 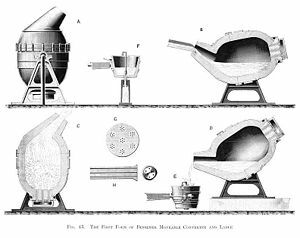 The invention from which Bessemer made his first fortune was a series of six steam-powered machines for making bronze powder, used in the manufacture of gold paint. As he relates in his autobiography, he examined the bronze powder made in Nuremberg which was the only place where it was made at the time. He then copied and improved the product and made it capable of being made on a simple production line. It was an early example of reverse engineering where a product is analysed, and then reconstituted. The process was kept secret, with only members of his immediate family having access to the factory. It was a widely used alternative to a patent, and such trade secrets are still used today. The Nuremberg powder, which was made by hand, retailed in London for £5 12s per pound and he eventually reduced the price to half a crown £ – 2 / 6, or about 1/40th. The profits from sale of the paint allowed him to pursue his other inventions. Henry Bessemer worked on the problem of manufacturing cheap steel for ordnance production from 1850 to 1855 when he patented his method. On 24 August 1856 Bessemer first described the process to a meeting of the British Association in Cheltenham which he titled "The Manufacture of Iron Without Fuel." It was published in full in The Times. The Bessemer process involved using oxygen in air blown through molten pig iron to burn off the impurities and thus create steel. James Nasmyth had been working on a similar idea for some time prior to this. A reluctant patentor, and in this instance still working through some problems in his method, Nasmyth abandoned the project after hearing Bessemer at the meeting. Bessemer acknowledged the efforts of Nasmyth by offering him a one-third share of the value of his patent. Nasmyth turned it down as he was about to retire. Bessemer licensed the patent for his process to five ironmasters, but from the outset, the companies had great difficulty producing good quality steel. Mr Göran Fredrik Göransson, a Swedish ironmaster, using the purer charcoal pig iron of that country, was the first to make good steel by the process, but only after many attempts. His results prompted Bessemer to try a purer iron obtained from Cumberland hematite, but even with this he had only limited success because the quantity of carbon was difficult to control. Robert Forester Mushet had carried out thousands of experiments at Darkhill Ironworks, in the Forest of Dean, and had shown that the quantity of carbon could be controlled by removing almost all of it from the iron and then adding an exact amount of carbon and manganese, in the form of spiegeleisen. This improved the quality of the finished product and increased its malleability. When Bessemer tried to induce makers to take up his improved system, he met with general rebuffs and was eventually driven to undertake the exploitation of the process himself. He erected steelworks in Sheffield in a business partnership with others, such as W & J Galloway & Sons, and began to manufacture steel. At first the output was insignificant, but gradually the magnitude of the operations was enlarged until the competition became effective, and steel traders generally became aware that the firm of Henry Bessemer & Co. was underselling them to the extent of UK£10-£15 a ton. This argument to the pocket quickly had its effect, and licences were applied for in such numbers that, in royalties for the use of his process, Bessemer received a sum in all considerably exceeding a million pounds sterling. W M Lord has said with regard to this success that "Sir Henry Bessemer was somewhat exceptional. He had developed his process from an idea to a practical reality in his own lifetime and he was sufficiently of a businessman to have profited by it. In so many cases, inventions were not developed quickly and the plums went to other persons than the inventors." Bessemer also obtained a patent in 1857 for the casting of metal between contrarotating rollers – a forerunner of today's continuous casting processes and remarkably, Bessemer's original idea has been implemented in the direct continuous casting of steel strip. Bessemer died in March 1898 in Denmark Hill, London. He is buried in West Norwood cemetery, London SE27. Other influential Victorians such as Sir Henry Tate, Sir Henry Doulton and Baron de Reuters are buried in the same cemetery. Bessemer was knighted by Queen Victoria for his contribution to science on 26 June 1879, and in the same year was made a fellow of the Royal Society. An Honorary Membership was conferred on Bessemer by the Institution of Engineers and Shipbuilders in Scotland in 1891. In 1895, he was elected a Foreign Honorary Member of the American Academy of Arts and Sciences. Sheffield's Kelham Island Industrial Heritage Museum maintains an early example of a Bessemer Converter for public viewing. A street was named after him in the town of Hitchin (Bessemer Close) bordering the village of Ickleford in 1995, and Bessemer Way in Rotherham is so named in his honour. In 2009, the public house "The Fountain" in Sheffield city centre was renamed "The Bessemer" in homage to Henry Bessemer, who had a huge impact on the Steel City's development. In Workington, Cumbria, the local Wetherspoons pub is now named after him. In 2002 the Institute of Materials, Minerals and Mining (IOM3) was established from mergers encompassing historical organisations including the Iron and Steel Institute, of which Bessemer was President from 1871-73; the latter organisation instituted the Bessemer Gold Medal under his tenure and IOM3 still recognises Bessemer's legacy with an annual award of the medal for outstanding services to the steel industry; recent recipients include Indira Samarasekera. In 2003 Bessemer was named among the top 10 technological innovators in Human Accomplishment: The Pursuit of Excellence in the Arts and Sciences, 800 B.C. to 1950. That a man who did so much for industrial development did not receive higher recognition from his own government was a source of deep regret for English engineers, who alluded to the fact that in the United States, where the Bessemer process found much use, eight cities or towns bore his name. ^ Coincidentally, on the same page of the London Gazette there is the knighting of Thomas Bouch who the following December became wordwide infamous as the designer and railway engineer of the Tay Bridge. ^ Sir Henry Bessemer Inventor & Engineer. Lucidcafe.com (24 November 2014). Retrieved on 1 July 2015. ^ Newton, David E. Chemistry of New Materials. New York: Facts on File, 2007. Print. ^ "Sheffield". Encyclopaedia Britnannica. Retrieved 25 February 2019. ^ Jeans 1884, pp. 12–13. ^ "Charlton House in England, Hitchin". Daily Telegraph. ^ The Chartered Mechanical Engineer: The Journal of the Institution of Mechanical Engineers, Volume 12. 1954. p. 519. Retrieved 8 October 2018. ^ a b c d Bessemer 1905. ^ "Sir Henry Bessemer's Connection with Printing". The Printing Times and Lithographer: 226–7. 1880. Retrieved 11 February 2019. ^ "Famous Inventors – Sir Henry Bessemer". The Meccano Magazine. April 1942. p. 130. ^ Boylston 1936, p. 218. ^ Boylston 1936, pp. 218–219. ^ a b Lord 1945. ^ Bessemer 1905, p. 172. ^ "Mushet, Robert Forester" . Dictionary of National Biography. London: Smith, Elder & Co. 1885–1900. ^ Coleford, Towns in the Forest Of Dean ForestWeb (fweb) – Virtual guide to the Royal Forest Of Dean Archived 22 August 2012 at the Wayback Machine. fweb. Retrieved on 1 July 2015. ^ IESIS Institution of Engineers and Shipbuilders in Scotland. Iesis.org. Retrieved on 1 July 2015. Gilman, D. C.; Peck, H. T.; Colby, F. M., eds. (1905). "Bessemer, Henry" . New International Encyclopedia (1st ed.). New York: Dodd, Mead. Anstis, Ralph (1997). Man of Iron, Man of Steel: Lives of David and Robert Mushet. Albion House. p. 140. ISBN 978-0951137147. Bessemer, Henry (1905). Sir Henry Bessemer, F.R.S. : an autobiography; with a concluding chapter. London: Engineering. Boylston, Herbert Melville (1936). An introduction to the metallurgy of iron and steel. Wiley. Jeans, William T (1884). The creators of the age of steel. Chapman and Hall. Lord, W M (1945). "The Development of the Bessemer Process in Lancashire, 1856–1900". Transactions of the Newcomen Society. 25: 163–180. doi:10.1179/tns.1945.017. Misa, Thomas J (1995). A Nation of Steel: The Making of Modern America: 1865-1925. Baltimore MD: Johns Hopkins UP. ISBN 978-0801849671. Wikimedia Commons has media related to Henry Bessemer. This article incorporates text from a publication now in the public domain: Chisholm, Hugh, ed. (1911). "Bessemer, Sir Henry" . Encyclopædia Britannica. 3 (11th ed.). Cambridge University Press. p. 823.